Centrifugation Rotor Calculator Click here for more biology tools. 1. Choose a rotor type or input custom rotor parameters. 2. Type in RPM or RCF. The other variable will be computed automatically as you type. 3. k-factor is always automatically calculated. 1. Select two rotor types or input custom rotor parameters. 2. Type in RPM or RCF for each rotor. 3. 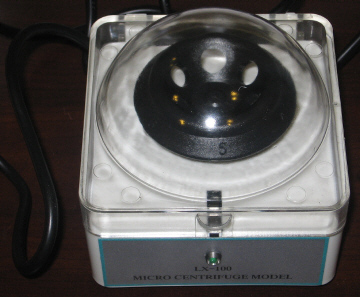 To compare centrifugation time, type in a centrifugation time for one of the two rotors. Centrifugation time for the other rotor will be estimated as you type. 2. Select a rotor or input custom rotor parameters. 3. RCF will be automatically set for a protocol and RMP automatically calculated. Note the quick guide is a general purpose guide for pelleting specific cell components. The centrifugation time is not giving here because it is dependent on specific protocol and rotor used. Please refer to your detailed protocol and use rotor comparison. Beckman: A-100/18, A-100/30, A-110, A-95, ACR-90, An-50Ti, An-60Ti, Batch Rotor, C0650 in Allegra 21 Series, C0650 in Allegra X-22 Series, C1015 in Allegra 21 Series, C1015 in Allegra X-22 Series, CF-32Ti, EM-90, F0485, F0630 in Allegra 21 Series, F0630 in Allegra X-22 Series, F0650, F0685 in Allegra 21 Series, F0685 in Allegra X-22 Series, F0850 in Allegra 21 Series, F0850 in Allegra X-22 Series, F1010 in Allegra 21 Series, F1010 in Allegra X-22 Series, F1202, F1802, F40.25, F241.5 in Microfuge R, F241.5 in Microfuge 22R, F241.5P in Microfuge 18 or 22R, F301.5, F2402H in Allegra 21 Series, F2402H in Allegra X-22 Series, F3602, FX301.5, FX6100, GA 6, GA-10, GH-3.8, GH 3.8A, GH-4.7, H6002, JLA-8.1000, JLA-9.1000, JLA-10.500, JA-10, JA-12, JA-14, JLA-16.250, JA-17, JA-18, JA-18.1, JA-20, JA-20.1, JA-21, JA-25.15, JA-25.50, JA-30.50, JCF-Z, JE-5.0, JE-6B, JLA 8.1000, JLA 9.1000, JLA 10.500, JLA-16.250, JR-3.2, JS-3.0, JS-3.4A-1250, JS-4.0, JS-4.2, JS-4.2A, JS-4.2SM, JS-4.2SMA, JS-4.3, JS-5.0, JS-5.2, JS-5.3, JS-5.9, JS-7.5, JS-13.1, JS-24.15, JS-24.38, JV-20, MLA-80, MLA-130, MLN-80, MLS-50, NVT 65, NVT 65.2, NVT 90, NVT 100, PTS 2000, PTS DLX, PTS DLXA, S0410, S2096 in Allegra 21 Series, S2096 in Allegra X-22 Series, S241.5, S4180, S5700, SW 28, SW 28.1, SW 30, SW 30.1, SW 32 Ti, SW 32.1 Ti, SW 40 Ti, SW 41 Ti, SW 50.1, SW 55 Ti, SW 60 Ti, SW 65 Ti, SX241.5, SX4250, SX4750 in Allegra X-12 Series, SX4750 in Allegra X-15R, SX4750A in Allegra X-12 Series, SX4750A in Allegra X-15R, SX4750u in Allegra X-12 Series, SX4750u in Allegra X-15R, TA-10, TA-10-250, TA-14-50, TA-15-1.5, TH-4, TI-15, Ti-14, TLA-45, TLA-55, TLA-100, TLA-100.1, TLA-100.2, TLA-100.3, TLA-100.4, TLA-110, TLA-120.1, TLA-120.2, TLN-100, TLN-120, TLS-55, TLV-100, TS-5-1.5, TS-5.1-500, Type 100 Ti, Type 16, Type 19, Type 21, Type 25, Type 28, Type 30, Type 35, Type 40, Type 42.1, Type 42.2 Ti, Type 45 Ti, Type 50, Type 50.2 Ti, Type 50.3 Ti, Type 50.4 Ti, Type 50 Ti, Type 55.2 Ti, Type 60 Ti, Type 65, Type 70.1 Ti, Type 70 Ti, Type 75 Ti, Type 80 Ti, Type 90 Ti, VAC 50, VC 53, VTi 50, VTi 65, VTi 65.1, VTi 65.2, VTi 80, VTi 90. Sorvall: A-384 (inner row), A-384 (outer row), A-500, A-621, A-641, A-841, A-1256, AH-629 (17 ml), AH-629 (20 ml), AH-629 (36 ml), AH-650, A/S-400, F-12/M.18, F-16/250, F-20/micro, F-28/13, F-28/36, F-28/50, FA-MICRO (in MC-12/12V/12C), FA-MICRO (in RMC-14), GSA, GS-3, H-400, H-1000B (buckets), H-1000B (microplates), H-2000B (buckets), H-2000B (microplates), H-4000, H-6000A (buckets), H-6000A (microplates), HB-4, HB-6, HBB-6, HBB-12, HG-4L, HL-2 and HL-2B, HL-4, HS-4, LA/S-400, M (inner row), M (outer row), RP45-A, RP55-S, RP70-AT, RP80-AT2 (inner row), RP80-AT2 (outer row), RP100-AT3, RP100-AT4, RP100-VT, RP120-VT, RTH-250 (buckets), RTH-250 (microplates), RTH-750 (buckets), RTH-750 (microplates), S-20/17, S-20/20, S-20/36, S45-A, S55-S, S70-AT, S80-AT2 (outer row), S80-AT2 (inner row), S80-AT3, S100-AT3, S100-AT4, S100-AT5, S100-AT6, S120-AT2, S120-AT3, S120-VT, S150-AT, SA-300, SA-600, SE-12, SH-80, SH-3000 (buckets), SL-50RT, SL-50T, SL-250T, SLA-600TC, SLA-1000, SLA-1500, SLA-3000, SM-24 (inner row), SM-24 (outer row), SP/X, SS-34, SS-34/KSB, ST-H50, ST-H750 (buckets), ST-MICRO, STEPSAVER 50 V39, STEPSAVER 65 V13, STEPSAVER 70 V6, Surespin 630 (17 ml), Surespin 630 (36 ml), SV-288, SV-80, T-647.5, T-865, T-865.1, T-875, T-880, T-890, T-1250, T-1270, TFT-45.6 (inner row), TFT-45.6 (outer row), TFT-80.2, TFT-80.4, TH-641, TH-660, TV-1665, TV-860, TV-865, TV-865B, TZ-28, TZ-28/GK. More rotors will be added in the future. If you would like to have your favorite rotor added into this program, please feel free to send us a suggestion. Suggestions of protocols are also welcome.